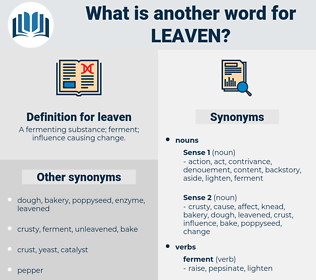 What is another word for leaven? A fermenting substance; ferment; influence causing change. The old leaven will out, - 'Eith to learn the cat to the kirn, ' as they say in the North. It contains the majority of the gentlemen and ladies by birth and education in each city, and they go far to leaven the whole lump. 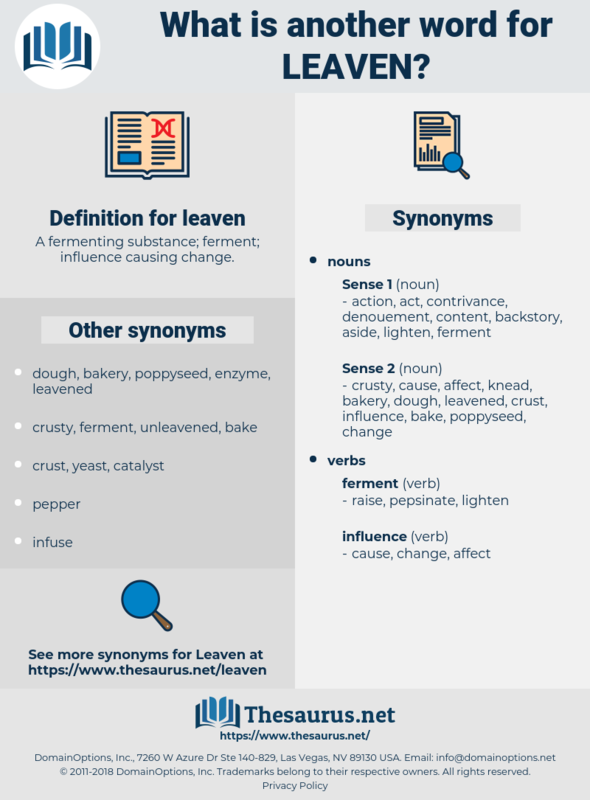 labium, life-of-man, lapin, lipemia, live in, lpn, love vine, lipmann, live on, lobefin, lipaemia, laban, lebanon, lipoma, livonian, lollipop woman, luvian, libyan, levan, low-beam, lupine, lipo-hepin, livonia, low beam, liven, lippmann, lupin. barm, sourdough, yeast, baking powder. elevate, bring up, get up, lift, raise.